Need a break? Pitch your tent or park your caravan by the water at these favourite national park campgrounds on the NSW North Coast. Spend your lazy days fishing, swimming, walking and whale watching from May to November. Whether you’re a seasoned pro or a first-time camper, the North Coast is the perfect place to escape to. History buffs will love staying at historic Trial Bay Gaol, while secluded Broughton Island campground is a special place for eco lovers. 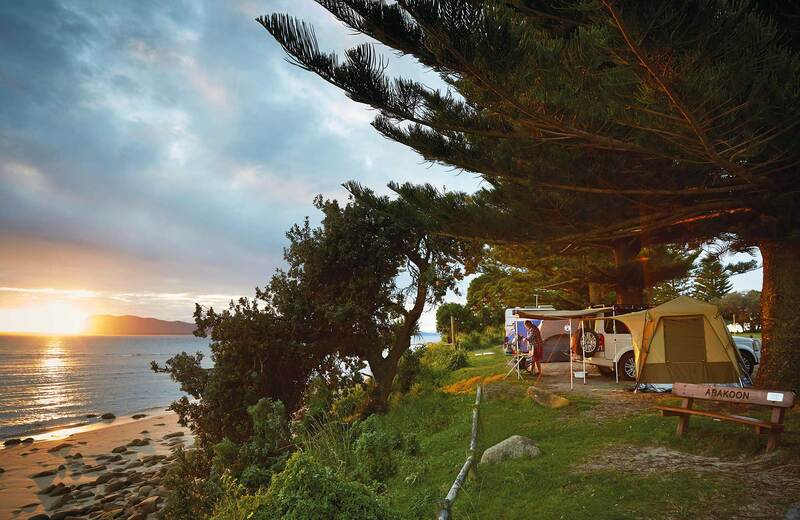 Extend your break with our stay 3 nights, pay 2 nights offer on selected campgrounds. The wild terrain rewards you from every angle at Doon Goonge campground near Nymboida. Take a scenic drive, or swim and picnic. Mungo Brush campground is a popular place near Hawks Nest on the north coast. Featuring caravan sites, it’s near the beach and the lake; you can go fishing, walking and kayaking. Base yourself at Rummery Park campground to enjoy the many walking, biking and horse riding trails in Whian Whian State Conservation area and Nightcap National Park. For a riverside adventure filled with swimming, paddling, fishing and wildlife spotting, try Platypus Flat campground in Nymboi-Binderay National Park near Dorrigo. Broughton Island campground is the only place in NSW where you can camp among an active seabird colony. Spend your days fishing, swimming, walking or whale watching at some of our best North Coast getaways.